Formula One and Kyle Who? Normally, I would pounce upon such a gift as the release of Max Mosley's letter to the FIA member clubs but my disadvantage in time zones has really caught me out on this one. I am late, in other words, and already Keith Collantine has done a masterly dissection of the offending document for his F1 Fanatic blog. There is really nothing to add to Keith's post; he even gets my good friend, Green Flag, frothing at the mouth so, obviously, he's getting it right! But it leaves me wondering what to write about today. Fortunately, I am rescued by a strange little item from Formula1Sport that is restored to full functionality after a week of falling over and staggering about helplessly. 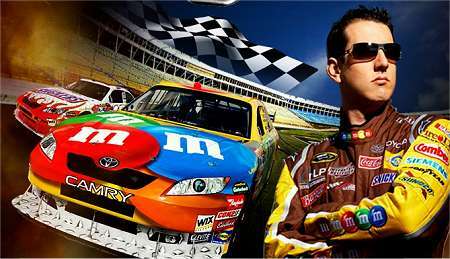 It seems that Kyle Busch, current leader of the NASCAR Nextel Cup Series, is negotiating to have a test in a F1 car. Apart from the interesting thought that negotiations are necessary to get even a test these days, this is a more momentous snippet of news than might be realized at first. As far as I am aware, no NASCAR driver has made the switch to F1 before. Drivers from the past like Dan Gurney and Phil Hill might have raced in both categories but that is not quite the same as a specialist such as Busch taking the plunge. A closer analogy might be, for instance, Richard Petty, the greatest of all stock car drivers in my opinion, suddenly deciding to pack it in and go racing for Team Lotus in 1970. That would have been fascinating indeed! Looking at the recent converts from F1 to NASCAR, it becomes obvious that the two categories demand very different skills. F1 race winners like Montoya are not really having the impact on NASCAR that we expected and are having to re-learn what amounts to a completely different trade. So how will NASCAR drivers adapt to the requirements of F1? We might expect that Busch will fail miserably if and when he gets his test for Toyota. He is being realistic about it and knows that it will be a severe test physically at the very least (he mentions neck muscles!) and that is a good place to start from. And it is possible that he might surprise us. Consider the times that rally drivers have swapped cars with F1 drivers and performed rather better than expected. It may just be that it is easier to adapt from stock-based cars to open wheelers than vice versa. Both stock car drivers and the rally men are used to far less grip than achieved by F1 cars so they must revel in suddenly getting the car to go where it is pointed without fuss. The F1 men, however, might be frustrated at losing all that grip and having to balance the car between sideways success and disaster. This is all speculation, of course, and Kyle might decide that he prefers to remain in stock cars. But it is a fascinating look at a possible future source of supply of drivers for F1, especially as it might mean that we see Americans involved in the sport again. Who knows? It may be that the success of NASCAR is not entirely the bad news for F1 that we have always supposed it to be. You may wish to consider Mario Andretti, who was quite successful in every venue in the US, including NASCAR, before going on to the F1 championship. It's an interesting avenue opened here although I'm not convinced Kyle Bush is really interested in F1 beyond a media splash, but it could poke some interest into some NASCAR drivers. These days NASCAR is about 'the good ol' boys' banging and crashing at high speeds. A little punch out or 2 gets the crowd going too. It demands a driver who is rough around the edges as well as having a lot of talent behind the wheel. A sort of completely different mentality exists in NASCAR and I'm not sure too many of these guys are the type to enter the flashy world of F1. I don't know, It just doesn't seem to be their style. I do watch NASCAR (not nearly as much as F1) and usually high speed ovals and they are quite good but just can't wrap myself around the idea of Dale Earnhardt Jr in an F1 car. I would have thought the biggest difficulty for a NASCAR driver would be the directness of an F1 car. Especially now the the electronic toys are gone you would have to expect that stepping into a car that turns in instantly and has an unstable (relatively) rear end to be a real difficulty for someone who has grown up with the more sluggish stock cars. I would expect lots of spins. Jeff Gordon had a run a few years ago and I know he really impressed the F1 people but he has a karting background so is a bit more familiar with the kind of response you get from a thoroughbred vehicle. Glad somebody remembered that Andretti once won Daytona because I sure didn't! Steven Roy mentioned, Jeff Gordon once tested for Williams, or was it Sauber? They did not sign him. Of the experience, Gordon says, "It's not the car's 'go' that surprises, it's the 'stop'." The reason Stew cannot fathom Dale Jr in F1 is because what forced exposure I have to Nascar shows me that Dale Jr isn't as good as his family legacy implies. Specifically, he'd overdrive the car and wreck them regularly. Have a look at the engines he popped last year for evidence. Indy probably doesn't "count", but there are several drivers in Nascar that have single-seater racing experience, the most notable is probably Tony Stewart. For those guys, it has to be all about the money, because I can't possibly imagine that A.J. Almendinger enjoys getting habitually lapped on an all-lefts track. There is an inkling part of me, mostly when they try road courses, that wants me to give Nascar a little bit more credit, quality-wise, because to the driver, all the different kinds of racing have the same objective even if the demands and techniques are slightly different. Oh, if A.J. Almendinger won't go back to single-seats, the Nascar driver I'd like to see try a single-seat car, not necessarily F1 right away, is Borris Said. There's one point you have all missed. Busch is sponsored and drives a Toyota, and he mentions this alleged test being held at Motegi a Honda owned track. I'm thinkin' fat chance he tours Motegi in an F1 Toyota or he does it in an F1 Honda given his Toy connections. It's possible, stranger things have happened but I give it about a 30 percent chance and think the boy is blowin' smoke. Pedro Rodríguez, winner of two GP's, drove in six NASCAR races between 1959 and 1971 with 1 top five and 2 top tens to his credit, his best was fifth in 1965’s World 600 at Charlotte at the wheel of a #51 Holman-Moody Ford. All good, interesting stuff for which I must thank you guys. I must admit that I threw this one in to see what kind of response I'd get from those who know more about NASCAR than I do. And it worked! So it looks as if Kyle is just getting a bit of publicity, as seems to be the general consensus - fair enough. I'd still like to see some of those good ol' boys have a try at F1 however. Jeff Gordon tried a Williams at Indy and Montoya tried the stock car at the same time. Gee, Clive, a second paragraph mention, am I to feel honored or ... what? Unfortunately, Keith's coverage re Max Mosley is never unbiased - the very title of the blog you refer to includes “lurid claims” and “desperate bid”, terms loaded with derogatory and derisory implications. I understand that he's playing to the gallery and preaching to the choir, but a modicum of fairness would make me, and I would like to think a few other of F1 Fanatic's readers, much happier. It is a great pity that Jeff Gordon never tried his hand at F1. I believe he would have been the best American GP driver ever. I doubt Senna, Schumi or Kimi could hustle a Nascar car around a road course like Jeff does. And I detest Nascar. As for Keith being biased on the subject of Max Mosley, we are all biased, one way or the other. My own feelings on the matter are pretty clear (and stronger than Keith's) from my relevant posts, I think, but I also make it clear that it's my opinion, not necessarily fact recorded in stone. Keith does a very good job when it comes to giving both sides of any story - I can't fault him on that. The headline to the F1 Fanatic post does make it very clear where Keith is coming from on this particular issue - you're right about that. But that is how it should be since he is effectively saying that the article that follows is his opinion. It has been much more common for Nascar drivers to drive at Indy in the Indy 500. Back in the day when Nascar wasn't trying to take over the world, they did not have a race on the same day in May as the Indy 500. Drivers like Cale Yarborough, Bobby and Donnie Allison qualified and raced in the Indy 500. Others like Junior Johnson and a few other tried to qualify, but didn't make the race. do i remember correctly that there were a couple of the cart drivers who used to run both the 500 and the nascar race? i think one of the andretti's did it jeff or john and maybe robbie gordon, too. yeah, that's that "lazy racing" we have here in the states for ya!